Most of the rarer cones from the Bensonville Collection, except for several such as Apache, Travis, Old Bohemian from National, and two English Lad brands. 1. Clay found in the early 1970's two of the best 1930's-1940's beer can collections. The Rosalie, Tiger, Gold Medal, woodgrain Waldolf Ale and other unusual flat tops were found in the basement of "Joe's Bar" at 108th St/Michigan. Clay had volunteered to help the owner clean out the basement, but not knowing any more than "some beer cans are down there." This "find" of around 115 flats and 10 cones was first described in a short article in the May, 1973 BCCA news report, before many of the unusual labels started to receive publicity. "Joe" of Joe's Bar started a collection of beer cans with an offer of a free beer in return for a different beer can that added to the collection. A number of the flats and cones exchanged were from can plant employees and have markings on them such as line #, shift, and time. Clay says the American Can plant was at 39th and Ashland, around a 30 minute bus ride away, and workers returning home would stop by Joe's Bar. The 2nd top group Clay bought in the early 1970's were over 150 12 oz cones and c50 quarts from the son of a Continental Can Company photographer who lived in Bensonville, IL. 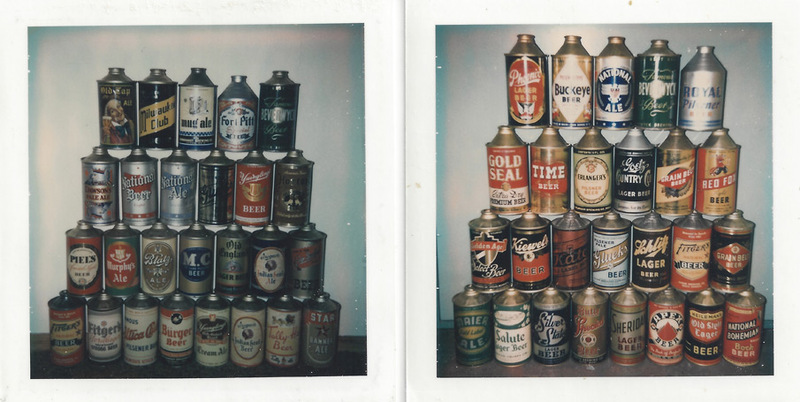 This collection was originally located by early BCCA member George Mrugacz, bcca #7, of Chicago, who passed the lead to Clay who later gave George a number of the cans for the lead. (This group of cones was written up several times in BCCA magazine and won awards at Canventions.) Clay especially liked his "Carnival of Cans" display that had cans on a miniature Merry-go-Round that he had assembled with his sons; however at one Canvention, that display didn't win an award as a BCCA officer running the display contest changed the rules, deciding not to give an award to the category in which Clay had entered his "Carnival of Cans" display. Over the past several decades, other collectors not involved originally in these two "finds" have made up various and different stories on how the beer cans were found: they were all from one collection; found hidden at Manhattan Brewery; collectors had to go blindfolded to a secret location where the cans were, etc. However, Clay's did get the cans and later stories by non-involved collectors might sound interesting, but are by persons who are trying to gain participation in these two unusual finds of old cans. 2. In addition to making two of the better finds of old cans, and having winning displays for Canventions, Clay was very generous helping beginning collectors by giving them groups of cans. Other times, such as when a collector in Indiana lost his collection in a tornado, Clay sent him many replacement cans. When visiting Denver for the 1974 Canvention, a retired Chicago Fire Dept. Captain who had moved to Colorado took Clay and his son to Pikes Peak wearing their street clothes. Along the way Clay saw some cans on the mountainside and went into the rocks to pick them up. As he moved farther into the rocks, he kept seeing more cans down under boulders and in retrieving the cans, to save his clothes he had to take his pants and shirt off. The Fire Captain could only look on at what a motivated beer can collector was doing. When Clay got back to the road the Fire Captain said, "I would never go there, rattlesnakes are under those rocks and you were lucky not to have run into one." 3. 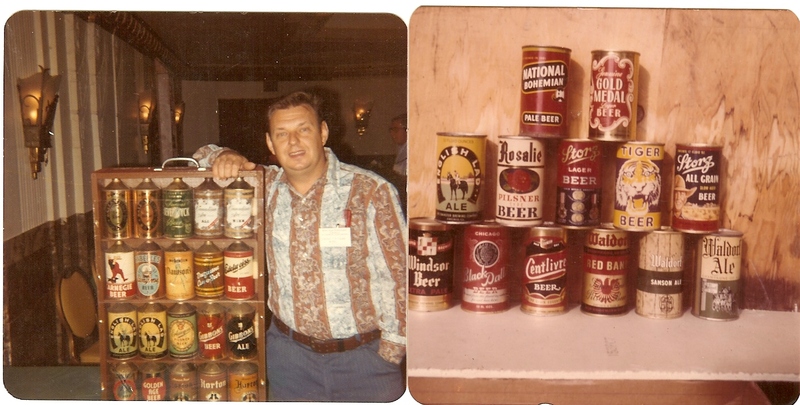 For some years in the early-mid 1970's Clay and Bob Myers had been trading cans and met at Denver Canvention. In 1975 when Clay decided to sell some of his better cones, he gave Bob Myers first choice; Bob only took the cans he needed for his collection, leaving top cones such as Travis and Apache for following collectors who would be visiting, such as Roger Wolken of Moline, IL who shortly afterwards sold out to Dave Peck and Jim Garard. The next year in the summer of 1976, Clay offered the rest of his cans to Bob Myers, mostly the flats and Chicago cones, but as he was more of a trader than a buyer, the cans were sold to Ken White, who was purchasing for Jim Garard. Copyright © 2007-2012 www.beercanhistory.com, All Rights Reserved. Last modified January 8, 2012.